Motivation – I am Cheap! I have a hosting account at DiscountASP.NET that I have used as a playground for anything I want to host on the web. My personal Coding Out Loud site is hosted there (with a few directories that are not linked, for example). Since starting the Boston Azure User Group, I need a place to host a page. While I would eventually like to host the user group site on Azure itself, for now I have produced a simple ASP.NET MVC site. To avoid paying for two hosting accounts, I am reusing my existing account – sharing the hosting across bostonazureusergroup.org and codingoutloud.com – but still maintaining their distinct identities. We can consider the Boston Azure User Group the main site, and Coding Out Loud the secondary site. Add a Domain Pointer with your ISP. If, like me, your site is hosted on a shared IP address, this step is necessary so that the site’s IIS web server knows which top-level directory your domain is associated with. In my case, this tells both codingoutloud.com and bostonazureusergroup.org to go to the same site. Configure your DNS. This is easier than it sounds. Your ISP will tell which DNS servers your should point to. You could also deal with Godaddy’s Domain Forwarding and cloaking, but for a one-time cost of $15 with my ISP (DiscountASP.NET) I just added the pointer – a cleaner solution, and possible more search-engine-friendly. 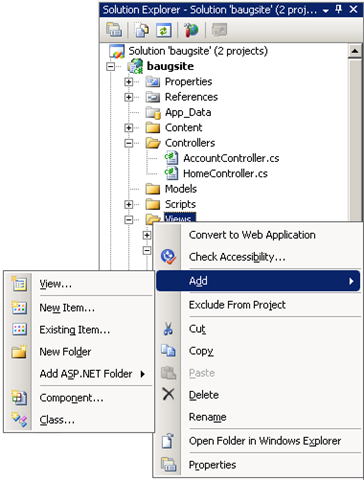 Note that the following changes to the code are only necessary if you want different results dependent on which domain is used to access the site – in other words, I don’t want my bostonazureusergroup.org visitors to be stumbling across any codingoutloud.com artifacts, and vice versa. The following screen shot includes the hack simple code modifications – they are circled – a private method with a little dirty work, invoke the method in the right place, and display a specific View. Note that the view is specified in a different file – and under a folder that is specific to your secondary site – CodingOutLoud in my case. Right-Click on Views folder and choose Add > New Folder from the pop-up. I called mine “CodingOutLoud” and it is shown above. Right-Click on the newly created Views/CodingOutLoud folder, this time choose Add > View… from the pop-up, as shown below. 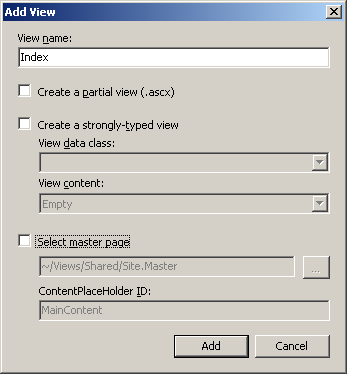 I called my View “Index” (and since it lives under CodingOutLoud folder it does not clash with other Views with that name, given the default routing rules). Once created, …/Views/CodingOutLoud/Index.aspx can contain any code you like – even plain old HTML. This is all it took to get this simple approach to work. Now when users visit via “codingoutloud.com” they are diverted to …/Views/CodingOutLoud/Index.aspx, and otherwise the usual machinery of ASP.NET MVC takes over. This entry was posted in Programming on September 27, 2009 by Bill Wilder. This post describes some key aspects of your development environment that need to be in place in order to to write and test code for Windows Azure. For all the developers running Windows XP face an obstacle to writing code for Windows Azure: developing for Azure requires Windows 7, Windows Vista, or Windows Server 2008. The fundamental dependency is that the Azure Fabric Controller (which runs on your desktop for development purposes, simulating cloud behavior) relies on IIS 7, which (you guessed it!) 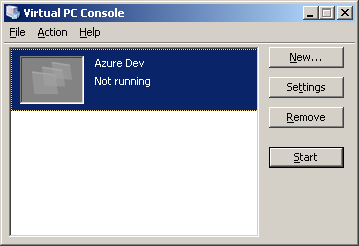 ships with Vista, Windows 7, and Windows Server 2008. One option is to upgrade your operating system. If you are not quite ready to do that, you have another option – use Virtual PC to run Windows 7 from Windows XP. 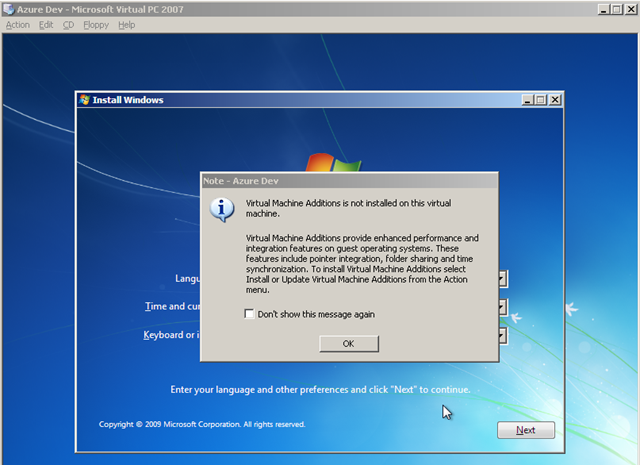 (This technique also works to run a virtualized Windows 7 image from Vista – or even Win 7 itself – since maybe you don’t want to foul your machine with beta software, like a sandbox for Visual Studio 2010 while it is still in beta (beta 1 as of this writing)). 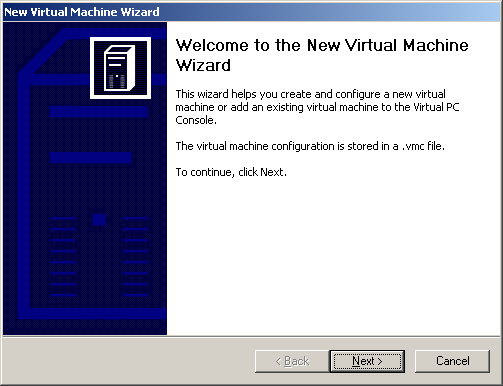 I wrote a separate, detailed post on creating a virtual machine image for Windows 7 using Virtual PC 2007. 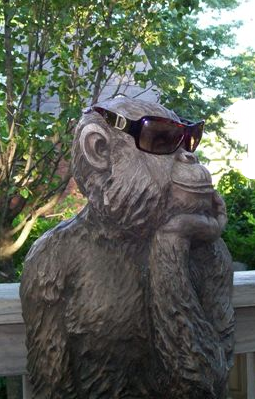 This entry was posted in Azure, Programming on September 22, 2009 by Bill Wilder. 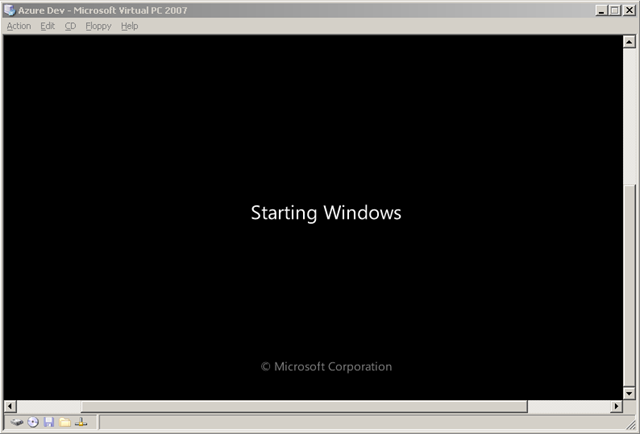 This post describes how to install Microsoft Virtual PC 2007, followed by a detailed walk-through of how to create a virtual machine image of a fresh Windows 7 installation using Virtual PC 2007. 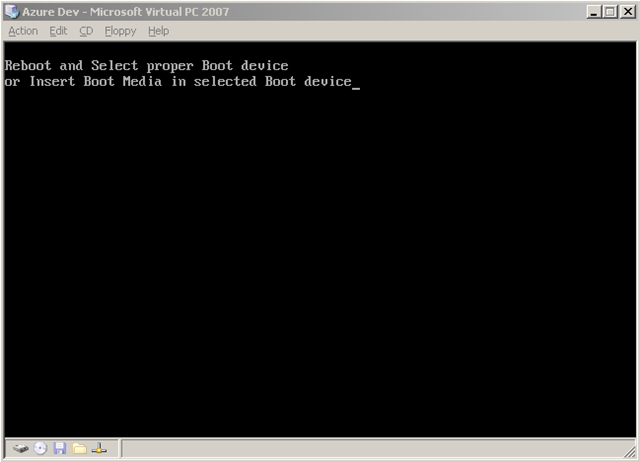 In this post I concentrate on creating a Virtual PC image for Windows 7, but the steps for the other operating systems are similar. Note this post deals with concerns for Developers. This post does not cover use of (related) virtualization techniques which are very popular today on the server-side. You don’t want to install Pre-Release software (like a CTP – Community Technology Preview, which means “very rough”) or beta software directly on your development machine. 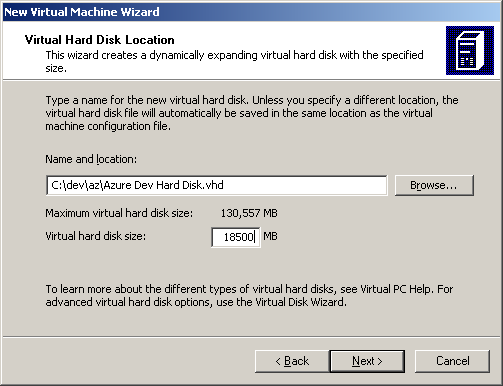 A virtual machine environment makes it easy to manage these without risking your real machine. You want to experiment. You may want to try out some testing with 4 GB or RAM, then maybe with 1/2 GB or RAM – so you know what to expect. Or you to keep testing something that changes your machine – and need to “start from scratch” frequently. You want to run multiple operating systems. You may want to run Windows 7 to make sure your apps run fine on it – but you also don’t want to give up XP quite yet. You can run Windows 7 within a Windows XP host. You want to set up a machine configuration and reuse it. You go through a lot of trouble to get your configuration “just so” and now want to share that with colleagues – or with yourself (on your home machine). Are there other Virtualization options? If you are a developer running XP -or- are running Win 7 on hardware that does not support hardware virtualization, Virtual PC 2007 is very likely what you want. 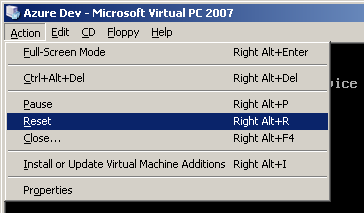 If you are running Windows 7, you can look into Virtual PC (sometimes seen as Virtual PC 7) (which includes XP Mode). Unlike Virtual PC 2007 which will work regardless of whether you have hardware virtualization, Virtual PC will work ONLY WHEN your computer supports hardware virtualization. 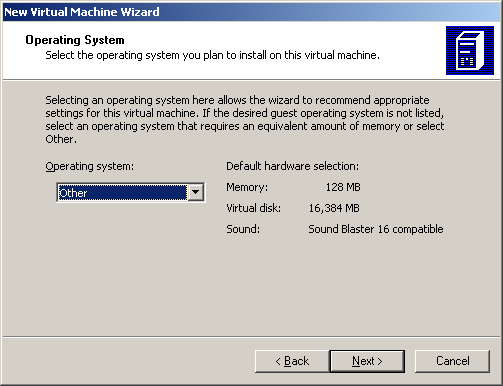 Does my PC support hardware virtualization (or XP Mode)? Unlike Virtual PC 2007, Virtual PC is for Windows 7 will not work on XP (but will work on the Windows 7 beta, sometimes known as Vista :-). Only one of Virtual PC -or- Virtual PC 2007 can be installed concurrently on any given machine. From Microsoft, other vendors, and open source, there are other sources of virtualization technology, and some might even be compatible with Virtual PC or VHD. [Did you know VHD format is an open standard?]. 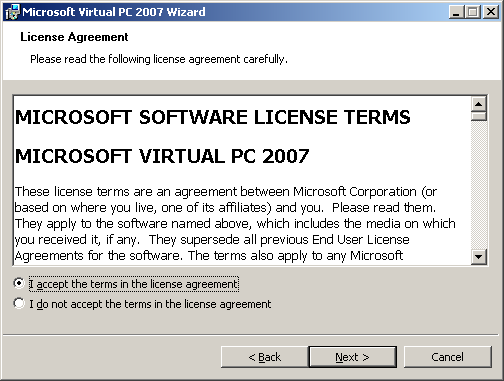 Though, consider that Virtual PC 2007 does not cost anything beyond the Windows license you (presumably) already have. Microsoft has many virtualization solutions, some with different purposes, such as App-V which is more for enterprise roll-out of apps (get it? App-V) to minimize incompatibilities due to other apps or environmental changes. For developers, let’s assume (for reasons stated above in prior section) that you want a parallel universe to run other software within – safely – like an early beta… Virtual Machine images make these scenarios possible and easy! Let’s get down to business and walk through how to install & configure these virtual images. The newer your PC, the more likely it is that it supports hardware acceleration for Virtualization. If you have this, you want to enable it for better performance. You may need to enable it in your BIOS. Unfortunately, the specific instructions will vary by computer manufacturer, so you’ll need to search the web for steps to enable Hardware Assisted Virtualization. Visit the download page for Microsoft Virtual PC 2007 download page for Microsoft Virtual PC 2007 sp1 and then select the appropriate version for your system (that is, 32- or 64-bit version). 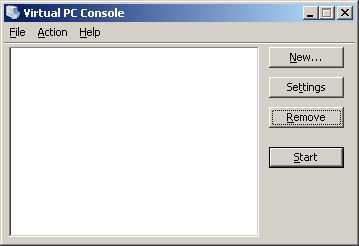 If you already have an earlier version of Virtual PC installed, you will likely see this self-explanatory message to uninstall the older version. 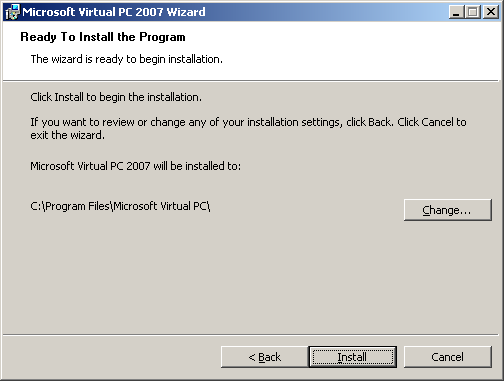 If you are upgrading to Virtual PC 2007 sp1 from Virtual PC 2007, the installer will handle it for you. Go to your trusty Add or Remove Programs applet and remove any remnants of old Virtual PC installs and proceed. 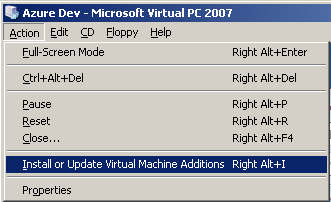 You can run Virtual PC 2007 and look in Help > About to see which version you are running. 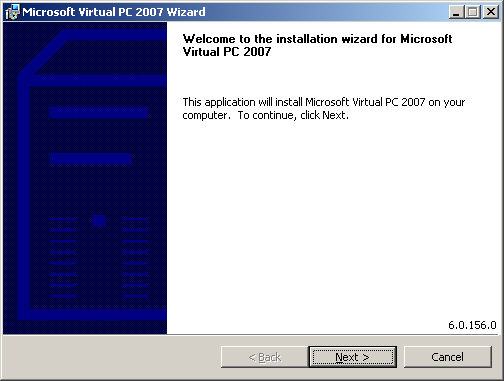 Version “Microsoft Virtual PC 6.0.192.0” is Virtual PC 2007 sp1, which is the one expected by the rest of this post. .. fill in your own info here, of course. I kept the default installation location and let it rip. It completed around 2 minutes later. 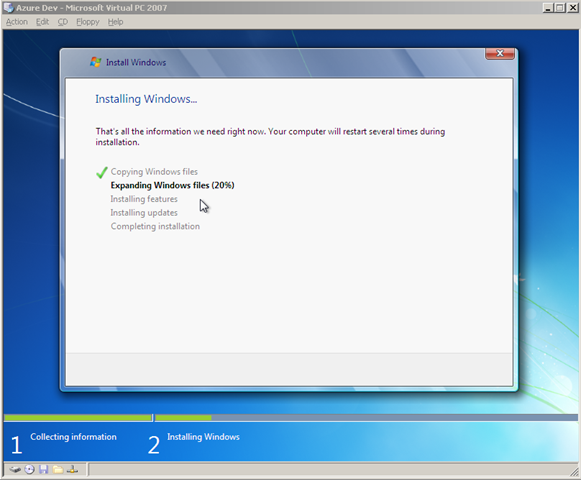 In order to install Windows 7, you need a copy of Windows 7. 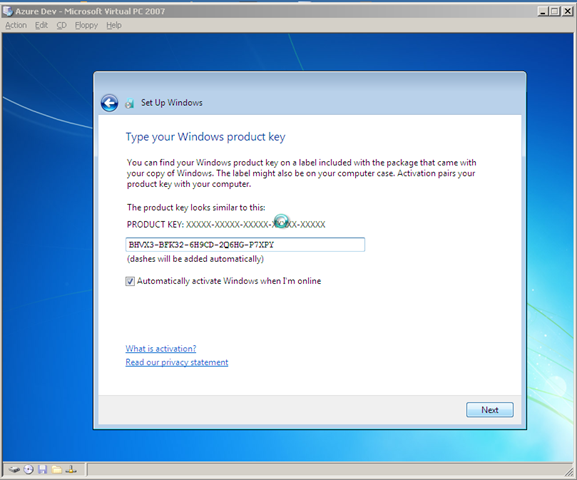 This could be a retail version of Windows 7 (from a DVD), but let’s make the assumption here that since you are a developer, you will be using a download image from MSDN that comes down as an ISO file, such as en_windows_7_professional_x86_dvd_x15-65804.iso. 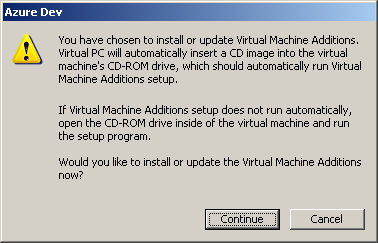 Note that you will need to install a 32-bit operating system to run under Virtual PC 2007. Log in to your MSDN account and select an appropriate version of Windows 7 to download, download it, and also be sure to copy the Activation Key (if applicable). You may wish to run the Windows 7 Upgrade Advisor on your machine to make sure Windows 7 will be happy (as of this writing, the upgrade advisor tool is in beta). Assuming that goes well..
How much memory is right? Considering Windows 7 system requirements (which call for at least 1 GB in the 32-bit version) and Visual Studio 2010 (beta 1) system requirements (which also calls for 1 GB (though not an additional 1 GB), you will hopefully be able to allocate at least 1 GB. I have 3 GB on my host machine, so I allocated 1.5 GB (1024 MB + 512 MB = 1536 MB). These values can also be tweaked later using Virtual PC. Click “Next >” and you are almost done with this step. If you have trouble starting your virtual machine due to not enough memory available, as in the following message, you either need to adjust its memory requirements of free up some memory. You might consider throttling back your Anti-Virus software which could be a big consumer of memory (I disabled the on-the-fly file-system protection). Also, of course, close all unnecessary processes. The long-term solution is to buy a 64-bit machine with oodles of memory and be happy with that. In my case, I selected “Capture ISO Image…” and installed from there. 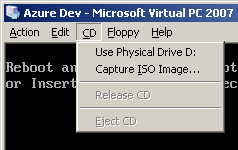 Note that you navigate your host file-system for the ISO image to capture – not the file-system on your virtual machine, since that does not yet exist. 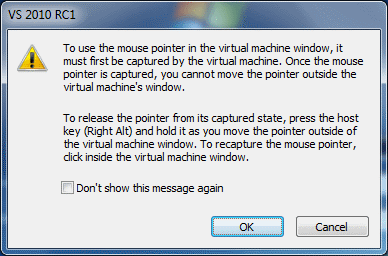 Don’t that forget the magic key/mouse combo to un-capture your mouse from the Virtual Machine is Right-Alt while dragging the mouse!! But that’s the end of the detailed tour. You should now have a usable baseline virtual machine image that you can reuse, share, play with, etc. 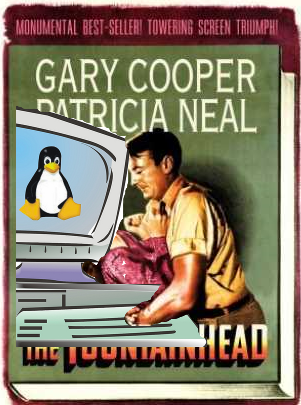 Make sure you create a back-up copy! And have a look at the features which allow you to manage roll-backs. This entry was posted in Programming, Step-by-Step and tagged virtual pc, virtualization, windows 7 on September 20, 2009 by Bill Wilder. The Boston Azure User Group will focus on Cloud Computing, specifically as it relates to Microsoft’s Windows Azure platform. This group will likely kick-off in October 2009 – exact date to be determined – exact dates have now been determined – now working on the times 🙂 – see the Boston Azure User Group site for details and updates – and to join the mailing list. What would YOU like to see covered in the meetings of the Boston Azure User Group? Please leave a comment with your thoughts / feedback. And see you at the Boston Azure User Group! This entry was posted in Boston Azure User Group, Events, Programming and tagged azure, Boston Azure User Group on September 18, 2009 by Bill Wilder.